We are Ecorana Environmental, an eco-travel and environmental education company that specializes in creating and planning applied learning holidays for students, researchers, and eco-tourists alike. The NABC workshop and certification session will be held at our partner facility in Belize, operated by the Toucan Ridge Ecology and Education Society (T.R.E.E.S), a grassroots conservation organization that operates the T.R.E.E.S Field Station which is a small biologist-managed research and education facility nestled in the picturesque Maya Mountains of Belize. 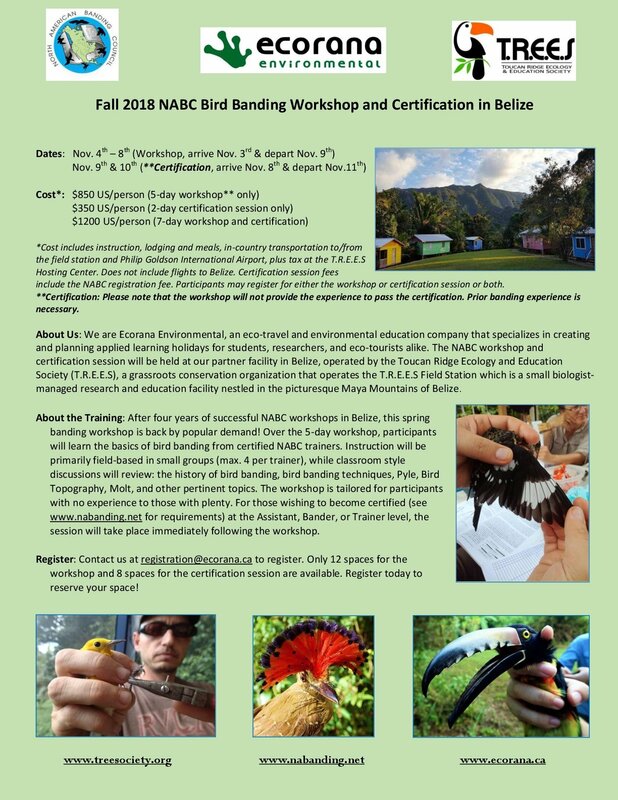 About the Training: After four years of successful NABC workshops in Belize, this spring banding workshop is back by popular demand! Over the 5-day workshop, participants will learn the basics of bird banding from certified NABC trainers. Instruction will be primarily field-based in small groups (max. 4 per trainer), while classroom style discussions will review: the history of bird banding, bird banding techniques, Pyle, Bird Topography, Molt, and other pertinent topics. The workshop is tailored for participants with no experience to those with plenty. For those wishing to become certified (see www.nabanding.net for requirements) at the Assistant, Bander, or Trainer level, the session will take place immediately following the workshop. Register: Contact us at registration@ecorana.ca to register. Only 12 spaces for the workshop and 8 spaces for the certification session are available. Register today to reserve your space!